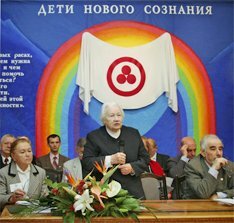 From October 8 to 11 2006, in the N. Roerich Center-Museum in Moscow, International Scientific and Public Conference “Children of New Consciousness” took place. The conference organizer was the International Center of the N. Roerichs, with participation of the Unified Scientific Center for Problems of Cosmic Mentality, the International League for Protection of Culture, the International Association of World Foundations, the Russian Academy of Education, the Russian Academy of Natural Sciences, the K. Tsiolkovsky Russian Academy of Cosmonautics, the H. Roerich Charity Foundation. The conference was supported by the UN Information Center in Moscow and the UNICEF. The conference participants included 6 Academicians, 15 Doctors of Sciences, 14 Candidates of Sciences, beside Russian scientists, the conference was attended by representatives from Ukraine, Belarus, Kyrgyzia, Latvia, Lithuania, Estonia, Israel, Finland, Italy, Austria, Bulgaria, Germany, the USA, Canada. Conference “Children of New Consciousness” brought together a considerable number of pedagogues, philosophers, psychologists, medical specialists, and representatives of state and public organizations dealing with issues of children’s education and upbringing. Most reports were dedicated to important problems of cosmic evolution, creative work of which has resulted in birth of children with new consciousness and new energetics. From the 80s of the previous century, this phenomenon acquired mass character. This phenomenon, which does deserve attention, is confirmed by many theses of the Living Ethics – philosophy of cosmic reality which contains methodology of new cosmic thinking and testifies to inevitability of appearance of man of a new energetic species on the Earth in this transitory period. Homo Spiritus – Man of Spirit is coming to substitute for Homo Sapiens – Man of Sense. Being a new energetic species of mankind, these children require a special attitude not only in the sphere of education and upbringing, but in all social spheres as well, for what the mankind is not yet ready, unfortunately. The conference keynote was the idea that the appearance of children of new consciousness demands radical reconstruction of the humanity’s world outlook foundations, and, first of all, of the out-of-date system of education and upbringing. Protection of these children under severe conditions of modern civilization is an extremely urgent problem. Especially acute this problem is in today’s Russia, where children are in an emergency situation. The conference scientific part was completed with a Round Table meeting at which many of its made speeches. Same as in 2000, when the problem of children of new consciousness was brought up for the first time, children – “the heroes of the day” – were invited to the conference. A special program was prepared for them, including exhibition of children’s drawings “We are Children of Light” which clearly showed the young artist’s cosmic attitude. <…> They have come. Not one by one, as it was 30 years age, but in a whole flow. And only an ignorant man with a low level of mentality can negate this phenomenon. <…> We are talking of the appearance of children with new consciousness, or, as they also call them, children of Light, or indigo, like the color of aura. Most such children have an aptitude for peace making. They have a developed sense of dignity, and all kinds of elements of slavery, adulation, or fear are not characteristic of them. They have very developed internal freedom which shows itself very expressly in their behavior. Standing in a queue or in formation is not possible for them. They often have problems with the authorities and various established systems in which they see no sense. <…> these children’s views are consonant with what we read in the Living Ethics about a New Man, New Epoch of our planet. The live example of children of Light as if illustrated the Living Ethics energetics and ideas, and turned them in front of our eyes into the action of our cosmic evolution. The Living Ethics is not only a philosophic teaching for our species of mankind, but also for the new one, which has already come. Appearance of children of Light, children of new consciousness, indigo children, representatives of the sixth race is a live proof of urgency, effectuality, and necessity of the real cosmos philosophy. It removes from the Living Ethics the stamp “I believe – I don’t believe” and opens before the teaching a wide road not only to the world of science, renovating the same, but to many people who have come to contact with children of Light, but have not yet understood or did not want to understand who they are and what is their evolutionary mission. – They tell about previous lives, give names of locations where they lived, for example, in Africa or in Egypt; they tell about tools, specific features of the plants which surrounded them. This is information that can be checked, and it is confirmed afterwards. 1. Despite all the openness, gentleness, and cordiality of children of new consciousness, it is impossible to force them to do what they do not find necessary or consider unacceptable for themselves. When objecting, they always take into account your point of vie. When they feel the need to do something their own way, you see in their eyes compassion, they feel sorry that you will have to go through unpleasant moments because of them. Such level of sympathy and compassion strikes. 2. As a rule, they show their creative abilities studying willingly painting, drawing, music. At that, they do not perceive themselves as future artists or musicians, it is just easier for them to make contacts through the harmonized world of art, the laws of which are for them more acceptable than tacitly established laws of society, like the principle of hardness of heart allegedly bringing success in the world of tough competition. Such children are most often miscellaneous and show themselves simultaneously in a few spheres of creative work. At that, their ability shades complement each other. Due to their gift synthetic character, it is not possible or expedient to study their abilities fractioning them into separate types. 1. Altruism and self-abandonment as the qualities of a developed heart and developed natural morality combined with a developed intellect and well structured consciousness. 2. The search for a method of their knowledge transfer. Refusal to communicate with those who, in their opinion, are incapable of understanding what they are talking about. In a number of cases, unwillingness to speak until the age of three years old, though they can already know all the letters by this age. 3. Endurance, backbone. Ability to find power for restoration in the most desperate situations. Sense of purpose. 4. Integrity of world perception. 5. Luminosity (you feel easy by their side). 6. Feeling of relation to the Higher. 7. Determination on collaboration (sometimes demonstration of self-sustainability). 8. Disagreement with a negative outcome, striving for correcting the situation, completing the fairy-tale, finishing the song. 10. Sincerity (manifestation of the “inner child”). 11. Possession of energy which at times cannot be mastered. 12. Love for motion, preference of trips to sitting games. 13. Possession of super-sensitivity close to extrasensorics. PHENOMENON OF CHILDREN OF NEW CONSCIOUSNESS. Giftedness is usually understood as an ability for outstanding achievements in some kind of activity. The working concept of giftedness formulated in the framework of the federal target program defines giftedness as an “integral manifestation of various abilities” and notes that “absence or loss of spirituality has often resulted in a loss of talent”. The concept distinguishes types of abilities manifesting themselves in practical, cognitive, artistic and aesthetical, communicative, and related to spiritual values activities what means “abilities in creation of new spiritual values and purposes, in service to people”. <…>. For the very principle of the heart does not allow people of new consciousness to ignore injustice, to leave unnoticed ugliness, distortion of Truth. Such purification is urgently needed, but it is naïve to believe that it will be readily accepted by everyone. The life of Cosmic evolution messengers abounds with examples of sophisticated baiting, keeping in the shade, deprivations. Even for a common man it would be hard to face the ordeals through which they went, and they were subtle and sensitive people! The historical experience shows: the life of children of new consciousness will not be easy, they will need our protection! They will also need support when they grow up. Both them and us need active collaboration. Humanity as a planetary phenomenon is single, and appearance of more and more children with an active and better formed hearty principle foreruns a period of general active development of cordiality. Though, as in everything related to consciousness, acceptance of this beautiful possibility depends on a personal choice, for development of consciousness does not endure violence. And still, the forthcoming time carries happy chances for everyone. If we accept them depends to a great extent on our mentality collaboration with new ideas: for such collaboration makes active the Principle of Beauty which animates the heart! However, as it happens quite often, the society both in the West and in the East turned out to be unprepared for appearance of the children of Light. They are characterized with an initially higher level of intellect in comparison with usual children, but in kindergartens and schools, they have to be in groups of children of their age. The adult environment is also alien to them, for the majority of adults just have no spirituality or morality. Those contradictions often make the reason for depressions of children of Light, and sometimes, inclination for suicide. There is another problem related to the children of Light. Probably, my point of view will look radical, and so unacceptable to many people, but the problem does exist. Since the children of Light are born with a ready basis of true knowledge (this possibility can be shown using simple physical models), and such children will make an overwhelming majority in the future, and then only this kind of children will be born, then the question arises: “And does pedagogy have future at all?” There are valid objections against this point of view. But do not hurry to make conclusions, we are trying to look into too unknown and too distant future. Secondly, one should clearly differentiate between peculiarities characteristic of just gifted and creative individualities and the indigo children. Both, for instance, are distinguished by such qualities as neglect for rules and examples, the need for a possibility of making a choice, persistence in having their own way. But not all creative children are indigo children. The new children are different between themselves same as all other children: each of them has his own individuality. I do not call to making of them some kind of little angels, endowed with only positive features. Entrance into our human world can result in estrangement, unsociability, protest, and other peculiarities in their behavior. I rather share the point of view of those psychologists and pedagogues who believe that, with their difficult behavior, these children as if put a mirror before adults, helping them to see and realize their own problems which provoke such behavior. And still, when we are talking of the children of new consciousness, it is this consciousness characteristics, and not their behavior peculiarities that must be the most important. Probably, from very early childhood, levels of abstract or intuitive intellect, perceptive to higher ideals always accompanying man in various cultures, are very active in these children; they are characterized with possessing values of the Beautiful, the Truth, the Good; a concept of evolution understood as ascent from darkness to light; models of direct relations, group activities, brotherhood, consensus; service as an activity is directed in their case at these magnets demonstration in everyday life with the purpose of bringing the maximum benefit to a maximum number of people. <…> The Russian language helps to understand many words the meaning of which is forgotten. First of all, this is the word “сознание” (“consciousness, mind, mentality”). If one knows Russian, saying “сознание”, one means knowledge which corresponds to somebody else’s knowledge, that is, it is not just knowledge, it is co-knowledge (literal translation of the Russian word “сознание” – translator’s note). Сознание (consciousness) contains, first of all, a sum of knowledge. And if this consciousness is new, the children coming to this world carry new knowledge for us. That is why revelation of the essence of the consciousness notion explains the expression “people of new consciousness. But it should be noted that there is no single quality distinguishing children of new consciousness from usual children, no, there is a complex of qualities. I will mention some of them. Another thing that I would like to say and what is also a problem related to the children of new consciousness. The delivered reports mentioned the problem of culture very little and very seldom. And culture is the basis of all that we are talking about now, because it is the energetic fundamental field and the main foundation of the cultural-and-spiritual, cosmic evolution of mankind. If there is no culture, we shall not be able to do anything. We shall not even be able to preserve these children, children of new consciousness, because we shall not understand this phenomenon. Unfortunately, for more than one decade, and especially now, culture is trampled under dirty boots. So, the problem of culture is, to my mind, very closely related to the problem of protection of children of new consciousness. Yes, we really live in a period when mass “slaughter of the innocents” is under way, what is related to the fact that children with a special mission are coming. Those are children of the sixth race, children of new consciousness. But, as I think, the relation to the Higher source does not make them so helpless as it may seem. It is the soil on which these new roses are to grow that is more helpless. It would be good if some summarizing book would be published, because the book “The Indigo Children” by the American authors is not enough, besides, in some places it tackles the problem of new children in not quite the right way. <...> it is written there, for example, of the incredible stubbornness of those children which are allegedly ready to break the wall with their foreheads or even kill a man, what absolutely distorts information of the indigo children. I believe that the teachers and parents who have paid a special attention to this opinion of the Americans, and proceed from it in their attitude towards such children, should be given correct information. Yes, they are open to the world, but one should not think that they have, so to say, a pink fate. <...> we have also had a chance to communicate with those new children which, through the adults’ fault, have become introverts. When adults injure their psychology with their attitude, they clam up and express their ideas in the language of signs and symbols, in their creative work. And very often, grown-ups cannot understand what these children want to tell, or they only understand a small part of it. So, I would like to draw your attention to the most acute issue: not to what kind of children they are (our conference has shown that this phenomenon does exist, one cannot negate it), but to protection of these children, to the methods of their education and upbringing.